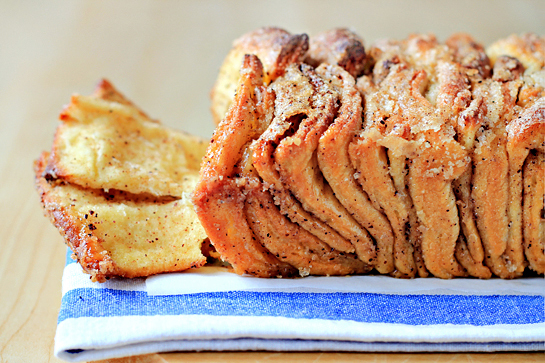 And let me tell you, this cinnamon bread really is yummy! Immensely! I am actually so impressed by it that I would call it a gift from heaven. Okay, maybe not exactly from heaven since the original recipe was born in Joy the Baker’s kitchen. But that place actually, when I think about it, is a kind of little heaven… on earth. Many would agree, I’m sure. Dear friends, please prepare this delicious, finger-licking, soft, yeasty, cinnamony bread over the weekend for your family. Or just for you. It’ll make you happy! So happy! Here’s the list of ingredients. 1. 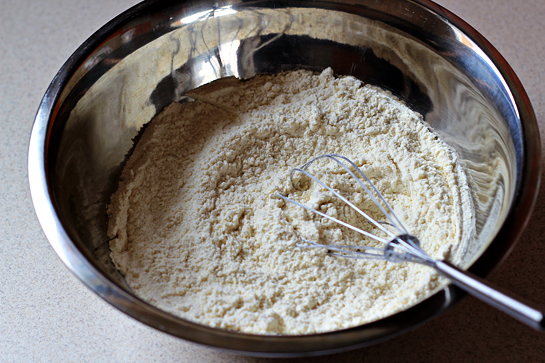 In a large mixing bowl, whisk together 2 cups (280 grams) flour, sugar, yeast, and salt. Set aside. 2. 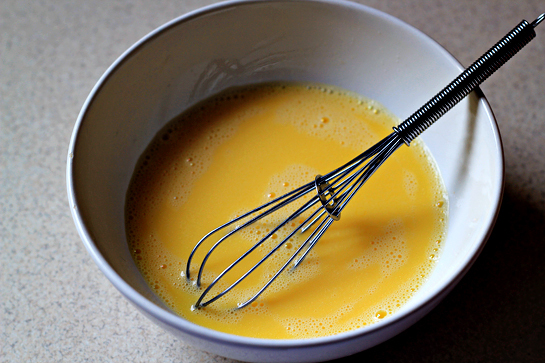 In a small bowl, whisk together the eggs and set aside. 3. And melt the butter with milk. I did this in the microwave oven (using a heatproof bowl). You can also melt the butter in milk in a small saucepan over medium-low heat. 4. Add the water and vanilla extract to the milk-butter mixture and stir a little. 5. Now pour the milk mixture into the dry ingredients and mix with a spatula. 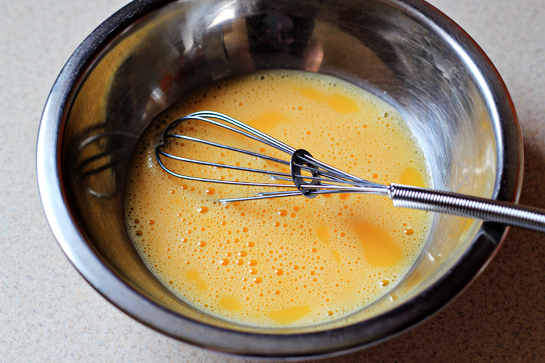 Add the eggs and stir the mixture until the eggs are incorporated into the batter. Add the remaining 3/4 cup (105 grams) of flour and stir with the spatula for about 2 minutes. Then knead and form a nice ball. I kneaded the dough by hand for about 10 minutes. You can, of course, use an electric mixer and have the job done in about half the time. 6. Grease a clean bowl a little and place the dough ball inside. Cover with plastic wrap and place in a warm space and allow to rest until doubled in size, about 1 hour. O-oh, we have a serious case of yeastafalitis here. Or, in other words, this is what happened after I let the dough rest for one hour. 7. 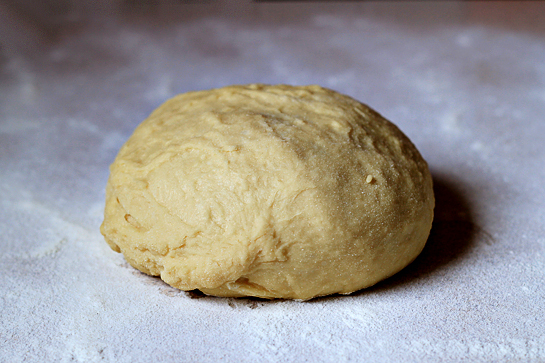 Deflate the risen dough and knead about 1 tablespoon of flour into the dough. 8. 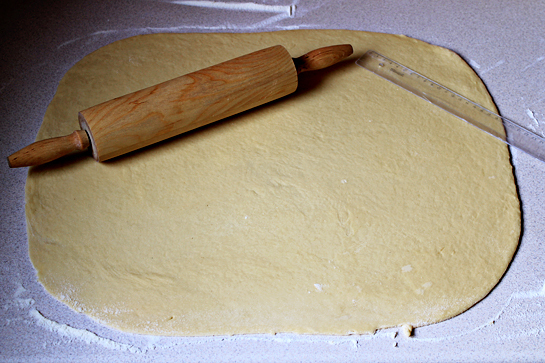 Place the dough onto a lightly floured work surface. 9. Roll it out until it’s about 12 inches tall (30 cm) and about 20 inches (50 cm) wide. 10. Let’s prepare the filling now. Melt the butter (in the microwave oven or in a saucepan). 11. 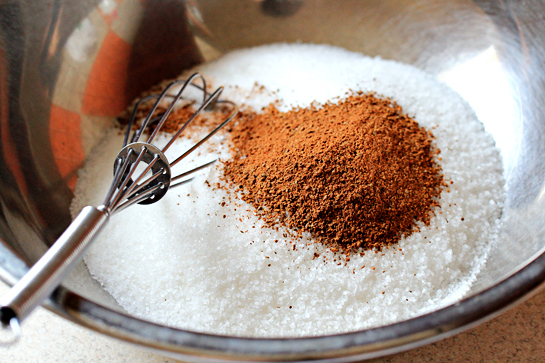 Mix the sugar with cinnamon. 12. Use a pastry brush to spread melted butter across all of the dough. Sprinkle with all of the sugar and cinnamon mixture. 13. 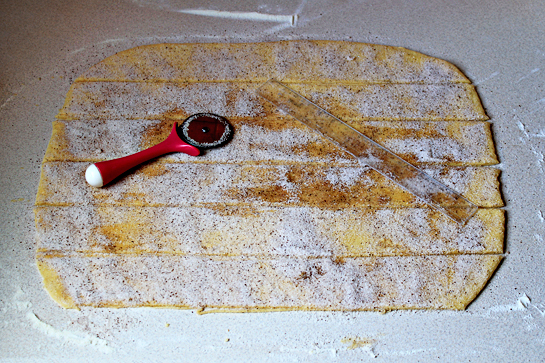 Slice the dough vertically, into six equal-sized strips. I went horizontally, it’s the rebel in me. Joy said she drooled at this phase. Well, as the picture indicates, I might have gone a little further. Or maybe it was the Cookie Monster who ate one WHOLE strip of the dough. In fact, I haven’t told you yet, but he sometimes burgles into our place and steals pieces of dough. And EATS THEM RAW!!! Shame on him. Really! Believe me! 14. Stack the strips on top of one another and slice the stack into six equal slices once again. You’ll have six stacks of six squares. 15. Grease and flour a 9x5x3-inch (22x12x8) loaf pan. The parchment is not necessary. The caramelized sugar would melt and that would tear the paper in the end. 16. 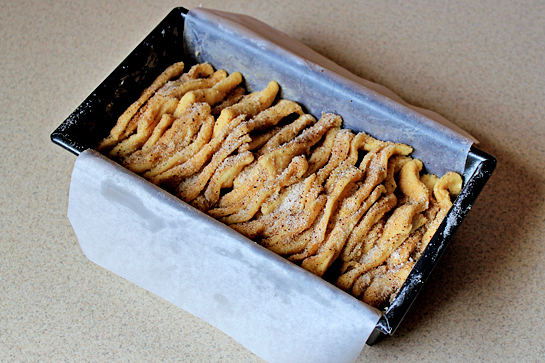 Layer the dough squares in the loaf pan like a flip-book. 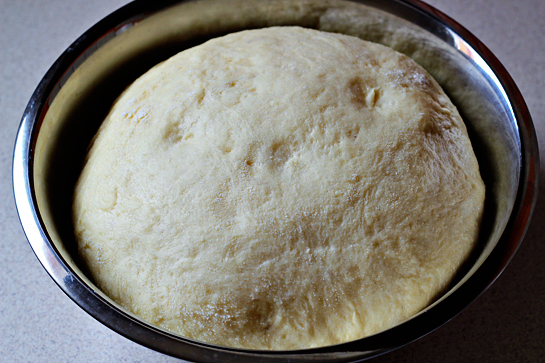 Place a kitchen towel over the loaf pan and allow to rest in a warm place for 30 to 45 minutes. 17. Then bake in the preheated oven at 350 °F (175 °C) for about 30 minutes or until the tops are very golden brown. The top may be lightly browned, but the center may still be raw. A nice, dark, golden brown will ensure that the center is cooked as well. Also, if you use a heavy, black loaf pan like I did, reduce the oven temperature slightly. Things seem to bake faster in it. 18. Remove from the oven and and allow to rest for 20 to 30 minutes. Run a butter knife around the edges of the pan to loosen the bread and invert onto a clean board. Place a cake stand or cake plate on top of the upside down loaf, and carefully invert so it’s right side up. And of course, enjoy dear friends. Which I am sure you will. I have seen this so many times in different forms but a new post on it never fails to make me stop and gawp dreamily at the screen. The only reason I havnt attempted it yet is cos i think it would be far too dangerous to have so much yummy bread in the house when its just me and my mum! But it just looks heavenly, that texture…oh…haha i think i may have to give in! Namiiiii!!! Rano k cajiku 🙂 fotecky ukazkove, krasne. Petraaaa!!! Stop taunting me!! This looks so good, but it is way too hot to bake! The only solution is that you send me some immediately…. Yum. This looks delicious. I will definitely be making this. Shame I didn’t see it earlier. It could have kept me entertained on my weekends stuck indoors from the rain! Very nice slice of bread. Can’t wait to try it! wait…am I going crazy or is it missing how many eggs we should use in the recipe? Yum. And you photos are lovely. This looks awesome, but you never included the number of eggs in the ingredients! Petra, someone mentioned that it was too hot to bake and thus you should send them some of this beautiful bread. I have to say, I may just have to ignore the 100+ F temperatures we are having here in Texas and bake some. I think it is vital to my existence! HAHA! I just took my first bite right out of the oven…DELICIOUS! Thanks for sharing, and beautiful pictures. Next time I think I will add raisins and see how that turns out. This may be a stupid question, but what do you mean by flip-book? This bread is sooooo great! We ate it all as soon as it came out of the pan, loved it. I also tried it with my go to quick way of baking rolls. One night I did not have yeast and wanted this bread badly. I had in my pantry a mix I use often for rolls. My grocery carries a Hot Roll mix. Little box has flour mixture and yeast, you add egg, butter, hot water. Makes a nice dough, wonderful rolls and a loaf if you wish. I used this mix for the dough proceeded from there, it was great too. Thanks for the recipe. This is the first time I have ever attempted a bread recipe. Everything, I found, was easy until I got to the kneading part… HAHA. For some reason I thought I had done it before and, eh, no big deal…obviously I didn’t know what I was doing & had dough stuck all to my hands. I managed to put the dough into the pan. Currently waiting for it to finish baking………………Delicious but I don’t think I kneaded the bread long enough. I will try again though! Thanks for the tasty recipe!! in the ingridents, you mentioned “Active Dry Yeast”….. but you didn’t let it raise with the water or milk first but instead pour into dry mixture. I just wonder the only yeast doesn’t need to raise first before mixing with dry ingridents is “Instant Active Dry Yeast”. 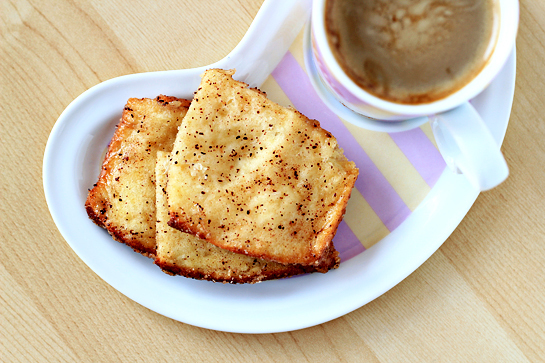 So would like to double confirm this with you before trying this yummy recipe! Yes, I have used the Instant Active Dry Yeast. Thank you so much, I baked it last night and my family loved it, It was soft, sweet and delish, my house smelled delish, thank you againg for the recipe, I love it!!! Just curious….is there a way to prep this the night before and cook it in the morning with equally fabulous results?? Can’t wait to try it! I just finished making this and it is AMAZING!! It was honestly my first time even kneading dough (I had to youtube how to do it lol) but it turned out great! I can’t wait for my hubby to get off work so he can try some! 🙂 Thanks for sharing!! Petra, this bread was absolutely fantastic! 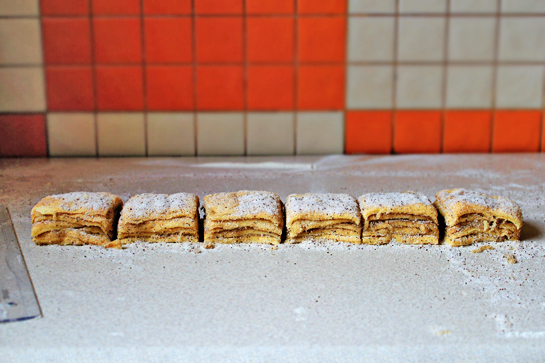 I really enjoyed the baking process as I love love love everything with cinnamon. The smell from the oven was making me drool and when i finally got to taste the bread, well, it was orgasmic. There goes my diet and thank god my family doesn’t like cinnamon! i must say! That is the most delicious bread i ever ate. Just took this from oven SIMPLY DELICIOUS so puffy–2 pcs popped out of pan!! I am good baker and cook but I just failed epicly at this recipe. I honestly have no idea what I did wrong. The dough was too wet from the start, so I added enough flour to make a kneadable dough. At the end of 30 minutes of baking time I still had raw dough in the middle of the pan, but the sugar mixture was heavily caramelized and erupting out of the pan. I eventually just took it out of the oven and while the outside pieces are good they are hard like rocks from all that caramel. I guess it just wasn’t my day? I’ve made your recipe : JUST PERFECT ! The best brioche ever, thanks for it ! I just made this the other day and it turned out amazing! heres the picture http://goo.gl/C6yGR the entire place smelled if cinnamon! So worth the prep time and patience. This really looks yummy and mouth watering! did you spell great wrong on purpose? I’m sure going to try making this really soon!1 It looks so yummy!! Amazing. If I didn’t give some to my mom, I would have eaten the whole thing myself. This looks absolutely wonderful! I cannot wait to make it. Thanks for sharing. Thanks so much for the recipe. We featured it in our weekly food trend blog post. You can check it out here. Thanks so much! Looks amazing. Amazingly easy to make. And most of all: tastes amazing!!! A real hit when I made this for the office the other day!!! looks delicious! i was actually looking for a simple & sweet recipe today and now i’m going to make this. thanks! This look delicious! I was wondering if I could use highly active yeast instead of instant dry. It’s all I have. I did this today with my 10 year old son & it was really “delish!” – his words. It required an extra 1/2 cup of flour, as the dough was too sticky. And i placed 2 pieces of parchment paper, crisscross, so as not to have the bread stick to the pan. This recipe was absolutely awesome! I made it just after I saw this page, and here’s the result! 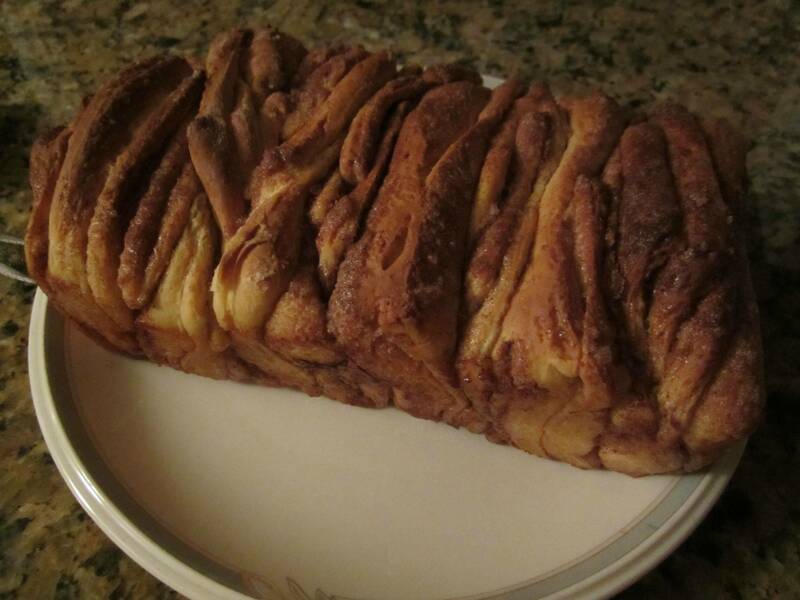 This is also known as monkey bread. its really popular in louisianna. mmmmm, I’m going to bake these next week! Does it have to have the vanilla extract ? Will it make a huge noticeable difference ? Found this site today. This recipe looks awesome. The layout of this site is really nice, too. How very CoooL! so want to try this at home, Thank you! Made this today and i had so much fun preparing it, i was a little scared cause my dough was verrrry sticky but i just went along and it came out great! i had to stick it in the oven a little more cause it was a bitty raw in the middle, nothing major, everyone loved it. I just made this today, and it was great! So delish. Quick tip: If you are burdened with an electric stove, I suggest leaving it in the oven for an extra 10 minutes than suggested. 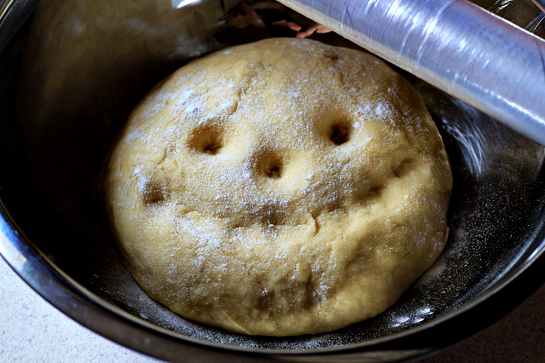 Followed your recipe to the “T” and my dough was unmanageable. I had to add so much more flour to the dough because it was sticky. Left my dough for an hour to rise, used the exact yeast, and my dough didn’t rise one bit. I have it in the oven now and check it every 1/2 an hour. When I pull out of oven and poke to see if it’s done, it is still raw and doughy in the middle. It’s like a loaf of dense bread, I can literally throw it through a window like a brick. It happens because the flour may be different (more or less gluten), the humidity levels… the temperature… it needs at least 38ÂºC to rise! In the end it was delicious! I made this last night after seeing it on your blog. I haven’t tried it yet but it looks sooooo good! Thank you so much for this recipe, i made it today and after 10 minutes half of it was gone thanks to my family 😀 It tastes sooo delicious! I used a little bit less than 2 oz. of butter for the dough and it was perfect! I substituted in 1/2 cup organic white whole wheat flour and to make a bit more healthy, final bread was flaky and light. To those complaining about sticky dough: When mixing in the last 3/4 flour into the mixed dough before allowing to rise, I increased the amount to 1 cup because my dough was sticky too at first. I will definetly be saving this recipe, and can think of so many different occasions to serve it. Great with coffee and tea, Thank you! Thank you so much for your recipe which I have found in Pinterest , it tastes delicious , I’ve just published it on my blog. How long can you keep this for? I want to make it in advance. Thanks. Hi there! Any chance this bread can be made without the egg? I’ll try for my kids. I think this recipe looks heavenly. Do you know if this would work with gluten free baking mix instead of regular flour? I have made this bread and it is dangerous! You cannot stop eating until it is all gone, it is best still warm from the oven. Omg. I just made this bread and its delicious! 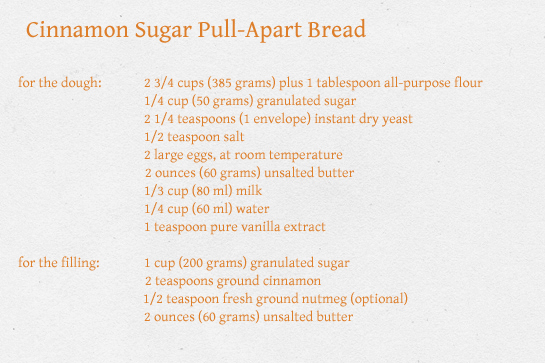 This recipe is just too good and one must be careful not to tip the scale when serving this bread for breakfast. 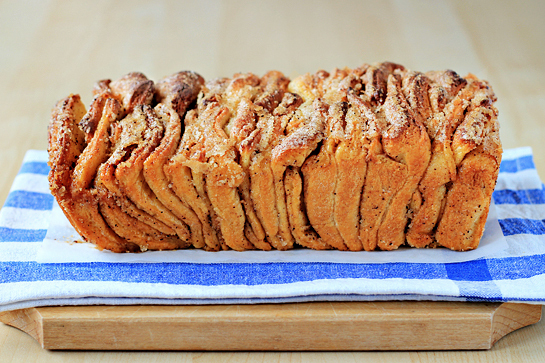 Guests at our Washington DC Bed and Breakfast are eager to have breakfast whenever they smell the sweet aroma of this Cinnamon Sugar Pull-Apart Bread. It looks delicious! I would love to try it right away! I follow your guide and the smell came when I took the bread out from oven. It is delicious! Thanks a lot for the recipe! I just want to say thank you and say that not only is this bread amazingly yummy but I have found it is impossible to mess up! I live in a pretty small city in China (where Western style bakeries, bread, cakes, and everything of that sort are very rare) and it is always a challenge baking here because 1. baking ingredients can be hard to find and 2. my oven is really just a super-sized toaster oven. Lucky for me (and my friends! ), the ingredients in this bread are all ones I can find here AND this bread always turns out perfect in spite of me having to cook it for an hour (my little oven is so weak). The last time I baked this my friends and I devoured it all within about 20 minutes and my friends could not stop talking about how perfect it was. So thanks for the recipe and happy holidays! Your bread is kind of famous here in Pingdingshan, China (well, within my social circle at least)! You have inspired me! Definitely will try the folding method next time! Thank you for this recipe. I made it and it was yummy. I also had an idea; What about using some gratered apple in rhe filling as well? It looks really yummy! This recipe is in my to-make list! Can’t wait to try it! Thank YOU!! Can I use whole wheat flour or mixture of all purpose flour and whole wheat one. I think I can also add some shredded apples to it because i like apple pie and apple toasts . I am drooling over this. Sadly, I am gluten-intolerant, but my kids would go nuts over this!